Nine new faculty members will serve as Daniels Fund Ethics Initiative at UCCS Fellows during the 2018-19 academic year. The prestigious Daniels Fund Ethics Initiative Faculty fellowships are awarded to UCCS faculty who demonstrate excellence in pedagogical activities related to applied business, professional and organizational ethics. The ethics fellow program started in 2011 in the College of Business and quickly expanded to other academic colleges across campus. This year, 47 educators on UCCS campus will serve as ethics fellows. Each fellow is selected based upon their proposal to encourage learning opportunities in ethical thought and decision making to their respective college and area of focus. This extension of principle-based ethics can take the form of developed materials for classrooms, workshops, and other various platforms, according to Tracy Gonzalez-Padron, director, Daniels Fund Ethics Initiative at UCCS and professor, College of Business. “We appreciate how an ethics fellow makes a difference to foster a culture in which ethical behavior is encouraged and expected. The number of students, educators and community members reached through the Daniels Fund Ethics Initiative at UCCS continues to grow because of the ethics fellows throughout our campus,” Gonzalez-Padron said. UCCS fellows work with ethics champions from nine colleges and universities in southern Colorado through the UCCS Southern Colorado Higher Education Consortium Ethics Champion Program, designed to expand principle-based ethics education and to create a collaborative community to champion principle-based ethics in Southern Colorado. A welcome reception and dinner was held on Aug. 17, to honor the incoming DFEI at UCCS Fellows and SCHEC Ethics Champions. The event included guest speakers, Vitaly Stepanov and Yuliya Stepanova, who shared their story of uncovering doping offences in Russia, despite great personal and professional risk. 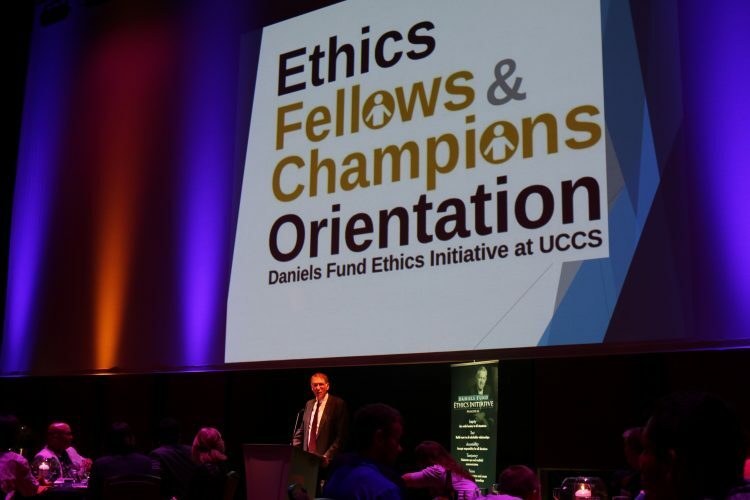 The Daniels Fund Ethics Initiative at UCCS aims to instill ethical principles into the personal and organizational decision-making process of every member of the UCCS community. The initiative is funded by a grant from the Daniels Fund, Denver. For more information, visit http://www.uccs.edu/~businessethics/. The UCCS College of Business was established in 1965 and has more than 1,100 undergraduates and 350 MBA and distance MBA students. The College of Business and Administration awards the bachelor of science in business and Bachelor of Innovation degrees. The graduate school of business administration awards the master of business administration and master of science in accounting degrees. More than 8,000 alumni of the College of Business live and work around the world. For more information, visit www.uccs.edu/business.